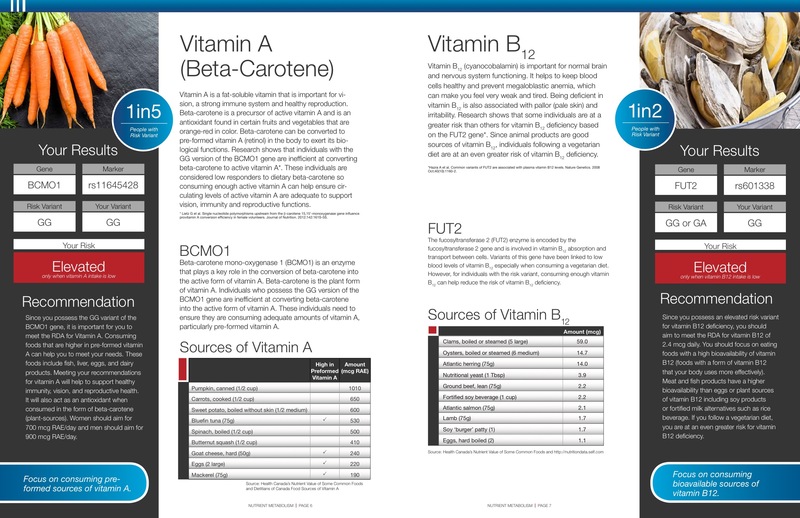 Vitamins and nutrition can boost or inhibit protection against effects of aging and environmental exposures. Caligenix tests for genetic markers associated with antioxidant and anti-inflammatory effects and possible deficiencies of certain vitamins. Antioxidants can protect skin cells from environmental and internal damage. Caligenix analyzes several genes which provide information concerning your antioxidant response. Skin glycation is a process by which sugar molecules link to proteins within the skin cells and lead to Advanced Glycation End (AGE) products. These products can leads to loose, cracked, and thinned skin. Caligenix analyzes markers in genes associated with glycation protection. Many cosmetic decisions are caused by skin aging leading to loose skin, wrinkles, and poor skin tone. Caligenix tests for genetic markers associated with cellulite, stretch marks ("striae distensae"), varicose veins, and provides information on available treatments of particular conditions. Conditions associated with skin inflammation can lead to skin redness, itchiness, pain, and intrinsic aging. Specific genes and markers tested include those associated with atopic dermatitis, contact dermatitis, psoriasis, and rosacea. Caligenix reports on a patient's predisposition to sun sensitivity as well as sun spots ("lentigines"), and wrinkles, which are all indications of photoaging. Skin changes are among the most visible signs of aging. Skin aging depends on genetic factors specific to each of us, as well as on our choices and lifestyle. It is a natural, irreversible process due to an accumulation of cellular damage over time. But what if you could delay the aging process with a revolutionary skin care technology that can improve your skin – and keep it healthy and glowing for years to come? "New skincare technology rarely gets us excited, but this got us tingling." "The report also tells you ingredients to look for when buying skincare — it's so simple!" "It's not realistic for a product to cater to every individual need of its customers, but this new product makes it possible." "Take the guesswork out of buying skincare by discovering your dermal strengths and weaknesses." How can Caligenix help guide personalized skin treatment options? 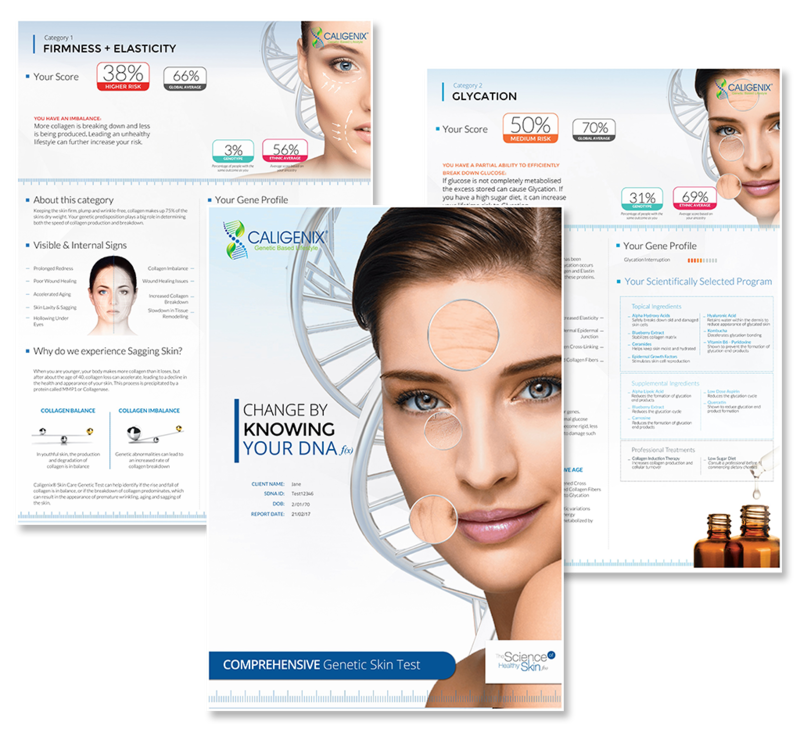 Based on the individuals’ unique genetics, the easy-to-read Caligenix report provides you with personalized skin care treatment choices to guide you through better use of skin care products and nutritional support as needed. 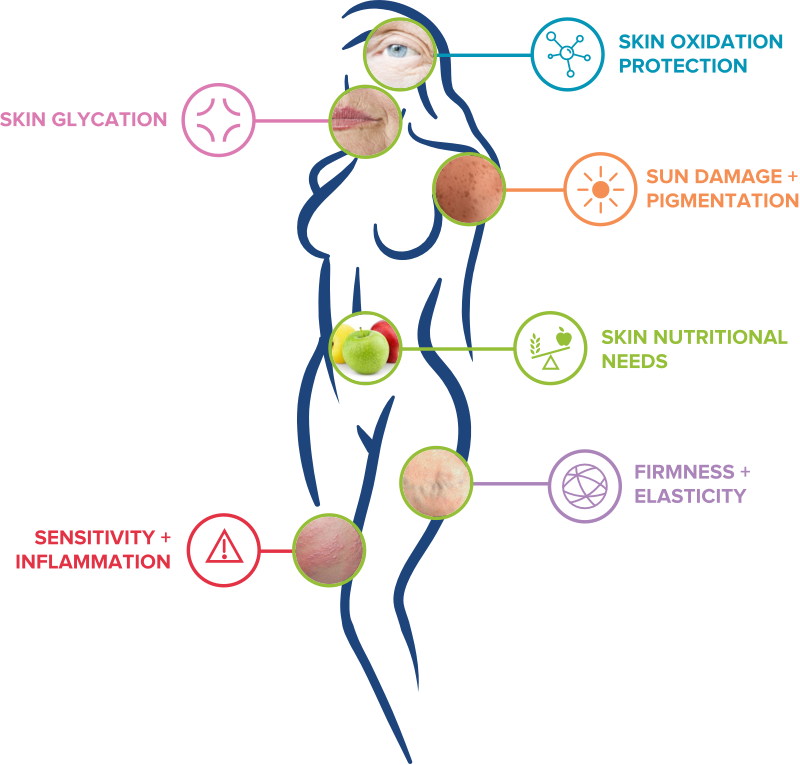 Caligenix provides personalized insights on the individual’s genetic predisposition affecting skin health. Caligenix empowers you with skin care treatment options and dietary micronutrient recommendations based on your genetic profile. Caligenix guides you through the overwhelming offers of different skin care products, and discover the innovative ingredients that science shows work best for your skin. Discover how genetics, lifestyle, and nutrition impact how you look and feel. This saliva based test is supported by scientifically validated genetic testing technologies, using clinically relevant markers and assays. In just 2-3 weeks, your Caligenix Skin Care report will be delivered and accessible from your computer and mobile device. Ready to discover your genetic potential? Caligenix® is set to enable its B2B clients to further customize and optimize their health & wellness offering based on genomic data. Through research and technological development, Caligenix® takes on innovative activities in order to develop/improve new services or products. We provide scientific evidence in order to validate product claims, improve brand credibility and responsibly elevate the consumer experience.